Previously unknown immune cell identified, which protects against lung infections during chemotherapy. It is known that chemotherapy drugs kill dividing cells, including cells in the bone marrow that give rise to different immune cells. However, this can lead to a dramatic reduction in white blood cells, including the neutrophils which play a central role in combating bacterial and other infections that are a common complication of cancer chemotherapy. Now, a study from researchers at St. Jude Children’s Research Hospital identifies a previously unknown form of an immune cell which protects mice from life-threatening lung infections under conditions that mimic cancer chemotherapy. The team state that they have identified a new form of housekeeping macrophage in mice which may be harnessed to protect against lung infections like bacterial pneumonia, which remains one of the greatest threats to survival of cancer patients during chemotherapy. The opensource study is published in the journal Proceedings of the National Academy of Sciences (PNAS). Streptococcus pneumoniae is a leading cause of pneumonia and one of the most common causes of death globally. The impact of S. pneumoniae on host molecular processes that lead to detrimental pulmonary consequences is not fully understood. The challenge has been how to create protective immunity in patients whose neutrophils have been severely depleted by chemotherapy, with new strategies sorely needed. An understudied aspect of S. pneumoniae infection is its direct impact on host cells and in particular its potential to induce cytotoxic DNA damage. The current study investigates DNA damage and repair in the context of human alveolar epithelial cells exposed to three major virulent serotypes of S. pneumoniae. The current study identifies macrophages, a type of white blood cell which digests foreign invaders and dead cells, produced in the lungs following vaccination rather than the bone marrow. The lab explain that normal mammalian lung function requires two types of macrophages, alveolar and interstitial, and therefore, this is a new form of macrophage which they named vaccine-induced macrophages (ViMs). Results show that once generated, ViMs were maintained in the lungs by cell division. Data findings show that unlike other immune cells types, the size of the ViMs population remained stable during chemotherapy. The group state that this newly recognized cell type also showed enhanced anti-bacterial activity in mice that lacked neutrophils due to chemotherapy. Working in a mouse model that mimics infection in chemotherapy-treated patients, the team observed that vaccination protected mice from lethal Pseudomonas aeruginosa pneumonia. Results show that once activated, ViMs persisted in the lungs for at least one month. Data findings show that when ViMs were transferred to unvaccinated mice with chemotherapy-depleted neutrophils, they were protected from lethal Pseudomonas infections. The team surmise that their findings show that S. pneumoniae induced damage to the host cell genome exacerbates its toxicity and pathogenesis, making DNA repair a potentially important susceptibility factor in people who suffer from pneumonia. For the future, the researchers state that going forward they will explore other, more practical methods to effectively induce tissue resident macrophage-like ViMs. They conclude that possible approaches include using drugs or signaling molecules called cytokines to induce protection in the immune-compromised host. 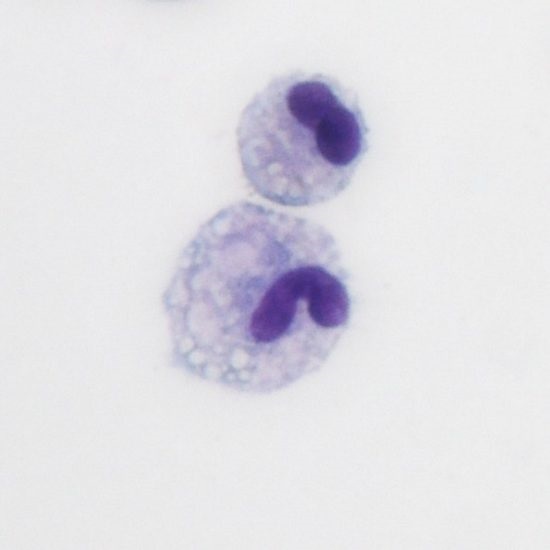 St. Jude Children’s Research Hospital researchers have identified a new population of resident lung macrophages (pictured here), which they called vaccine-induced macrophages or ViMs.